They are so confident that your children will love Fizzy Wizzies that they are giving away free samples for you and your family to try. You will receive 25 free sample tablets, enough for 5 to 8 baths. 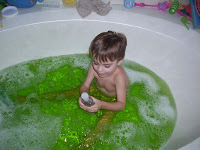 Fizzy Wizzies are effervescent tablets that will turn your kid's bath water red, yellow, or blue. Mix the tablets together to make a world of different colours - purple, orange, or green. NOTE - They have a larger sample pack that includes over 150 tablets available for $3.99 plus $4.95 shipping and handling.